Something I always like to do for Christmas is get some personalised presents, I always without fail make my mam a wall calendar filled with photos from the previous year. I did get her one this year but I wrapped it before I had a chance to make this post! So anyway, I always tend to use Snapfish, just because I've never been disappointed with the quality and the prices aren't too expensive, plus they always have deals and discount codes! So this year aside from the calendar I also picked up a couple of their Christmas Round Acrylic Ornaments, which I think will look so cute for the Christmas tree! I took some super sweet photos if my gorgeous little pooches, wearing their Christmas jumpers! So I decided to make 2 ornaments, one for each of the dogs. They're a little on the expensive side at £8.99 each but at the minute they're offering 2 for 1 with the code BEST616 so that's a good deal! I also got one of their Christmas Cards, I think it's a super cute idea to give personalised cards to friends or family, I of course had to again use a photo of my pooches, because why not?! 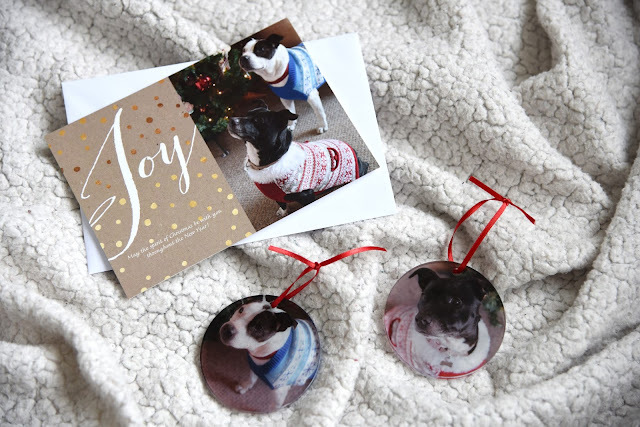 Snapfish are trying to encourage people to get the whole family together (or dog family in my case) to take some festive group photos for the photo cards! The cards aren't too expensive for being a good quality, starting at from 75p each. They also do them in packs if you're looking to order lots. They have some lovely creative designs you can pick from and personalise, I decided on this Joy design which I think is so cute!